That's how much I paid for the dress form in the picture. The price was so reasonable because it is used. There's a place here in Raleigh, NC called A&B Store Fixtures (on Capital Boulevard) that sells, well, store fixtures. This includes new and used dress forms, mannequins, feet for sock displays, and other store display apparatuses. Ebay sells new dress forms for around $65, and that's not including shipping. Shipping costs were high (sometimes costing as much as the form itself) due to their "humongousness". Many of the new dress forms at A&B start at $35. If you live in the area and want one, you must go. I must warn you, though, that you will have a difficult time tearing yourself away from the place. This isn't the original one I bought. You know the one that scared the ba-jeezus out of me when I walked into the knitting room? I had to return her because she was too big for my needs. Which is probably for the best since we would have ended up fighting anyway. I must say, though, that when this new one is displaying a sleeved sweater, it tends to send my body into "fight or flight" mode. Oh, and she needs a name. 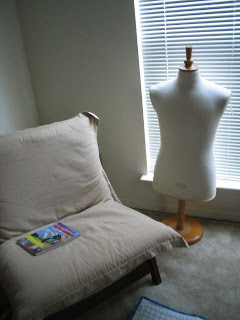 If you have a mannequin/dress form, you MUST give her a name. It's the law. But I'm having a difficult time thinking of one I like. Ideas?